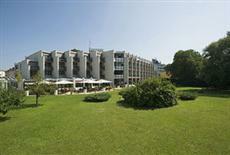 The Hotel Rosenvilla is perfectly located for both business and leisure guests to Salzburg. The Hotel Rosenvilla boasts a convenient location with modern amenities in every guestroom and superb service. Each guestroom features amenities such as non smoking rooms, daily newspaper, television, bathtub, shower, balcony/terrace. The basic amenities provided at this Salzburg accommodation comprise laundry service/dry cleaning, room service, safety deposit boxes, tours, business center, pets allowed. For a more enjoyable stay, guests can take advantage of a variety of recreational facilities, including massage, sauna, outdoor pool , garden. Modern comfort and convenience are seamlessly combined to ensure the guests' satisfaction. Please complete our secure online booking form by entering your period of stay.